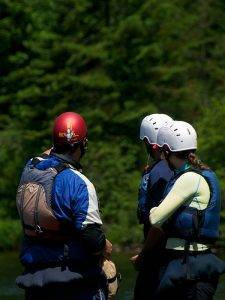 The Kennebec River is considered to be a high volume class IV river. It is dam controlled with daily scheduled boatable releases throughout the months of April to October. The Kennebec River originates approximately 50 miles upstream at Moosehead Lake in Greenville, ME. Moosehead Lake drains into the East Outlet of the Kennebec, which then flows into Indian Pond. Harris Station serves as the abutment holding Indian Pond back from flooding the narrow forge of the Kennebec River below. 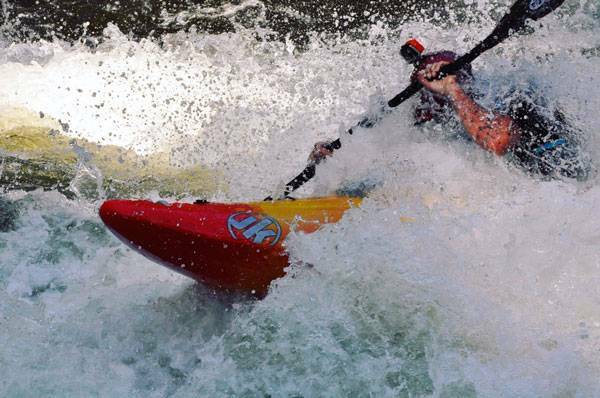 By reading this article we will take you down the river from a kayakers point of view. 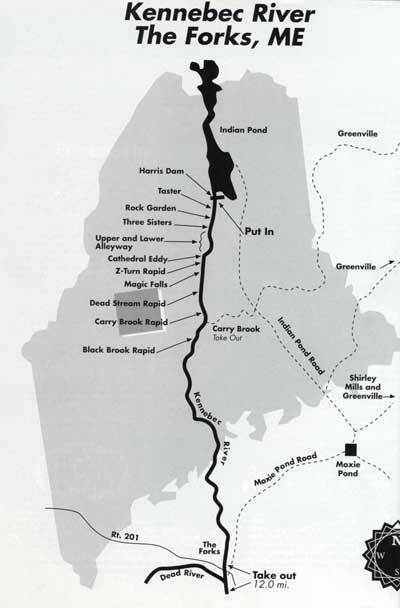 Historically, the Kennebec River was used for logging up until the 1970s and many of the features of the river are reminiscent of its long history. For example, the put-in of the Kennebec features a 300-foot metal sluice once used for diverting the logs from Indian Pond around Harris Station on their two year journey to the Atlantic Ocean. The Kennebec River is released at Harris Station with typical boatable flows of 4800 cfs up to 6000 cfs, with a few scheduled turbine test releases as high as 8000 cfs. The release is scheduled to accommodate peak energy production and, therefore, the water is usually released between 10:00 am and 2:00 pm. The Kennebec River loses an average of 23 feet per mile over 12 miles with a maximum gradient of 53 feet per mile. Rapids range in class from I-IV with a majority of the whitewater within the first 6 miles. Although there are plenty of eddies everywhere, you must have a bomb-proof roll before attempting the river as it is a LONG swim with minimal evacuation points. At 6000 cfs and above, there is a small ledge hole directly across the river from the put-in that throws right. 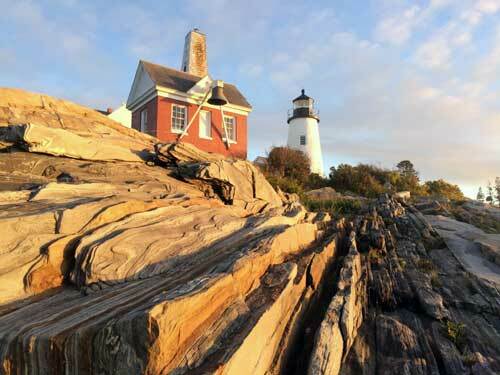 This is a great place to stretch and warm up before heading down the throat of the Kennebec. An eddy river left precedes your first class II rapid, Taster. There is a small wave train starting in the center of Taster and working itself left of center, a great place to get a little “taste” of the river. At the bottom of the rapid, as it turns right, there is a large eddy river left signifying the beginning of the next class III rapid, Rock Garden. In Rock Garden, there are two large holes left of center that you definitely want to avoid, unless you want a good lesson on window-shading. The run is right of center and once you get to the bottom of the rapid, there are two very large eddies on both river left and right. The eddy river right is called the “Chase Stream Sluice,” where they once rolled logs down the riverbank into the roaring waters below. At the top of the river left eddy is a small glassy wave, surfable at most levels but nothing to write home about. The next rapid, class III, is called “Whitewasher.” At the top of this rapid river is “Goodbye Hole,” a large pulsating wave hole at most water levels. To run “Whitewasher,” paddle the rapid left of center down a large wave train getting ready to surf “Big Kahuna” wave at the bottom. Nearing the bottom of the rapid river left, look for a rock point littered with photographers and videographers. If you can, try to catch the microeddy behind it. To do this, you must enter the eddy really low and immediately pop out into “Big Kahuna” before being hurled into the rocks at the top of the eddy. Most people just choose to catch “Big Kahuna” on the fly. Below “Big Kahuna” river left and right are two large eddies called the “Cathedral” eddies. This is really the first place you can stop and catch your breath after running the alleyway. The river left eddy is known as “Pocket” eddy, aptly named because anything in the river (swimmers, boats, paddles) ends up here. There is a large eddy fence which will deny a lot of inexperienced boaters the much needed rest. After catching your breath, you can paddle to the top of “Pocket” eddy and attempt to surf the pulsating wave train sweeping by. There is an awesome eddy line coming off the point at the bottom of the river right “Cathedral” eddy. Known for sky-scraping enders, monster stern-squirts, and spooky mystery moves, this eddy line is a must paddle. The next rapid is “Z-turn,” a class II. There is a great flat-spinning hole located at the top, river left, with a small wave behind it that you can front-surf. The rapid is run river left at the top which then sweeps you to the outside of the 90-degree turn, basically following the wave train. Your next sight will bean abrupt horizon line, signaling the arrival of the class IV “Magic Falls.” There are multiple ways to run Magic; there is a left slip, a right slip and the meat. First-time boaters be advised to eddy out above and scout the rapid to choose the most appropriate line for your experience and comfort level. Directly after “Magic Falls” hole river right is a NASTY recirculating pile of hydromadness named “Maytag,” as in the washing machine. Halfway down the rapid river left is a large haystack wave called the “House” wave, easily accessible from an eddy along side. One more thing to watch out for is the very shallow “Hell Hole,” bottom of the rapid river left. There is now a scenic section of flat water leading up to a class II, “Swimmer’s Rapid,” a great place to work on you wave wheels. “Dead Stream Falls” rapid, class III, follows this. The 15-foot cascading “Dead Stream Falls” waterfall river left preempts the rapid. The rapid is run right of center following the wave train. “Carry Brook” rapid, class II, follows. While skirting the minefield of squirrelly little holes, be sure to avoid the large menacing keeper bottom river left known as “Kayak Keeper,” a very appropriate name. “Carry Brook” is the halfway point for the entire 12-mile Kennebec River trip and the point where most experienced hard boaters cut out and most inexperienced hard boaters cut in. The rest of the trip consists of class I-III and flat water into the town of The Forks, Maine. There is a takeout river right known as “The Ballfield.” A short walk here will bring you to a general store and a pizza joint, great places to gas up your vehicle and body. If you decide to call it quits at “Carry Brook,” be prepared to huck your boat up to the parking lot via 182 backbreaking, wish-you-didn’t-chain-smoke steps. After spending a few hours catching your breath from the grueling hike up the embankment, you will appreciate the friendly and easy shuttle of the Kennebec. There is a large community of boaters, both commercial and private, and it is always easy to catch a ride back up to the dam. 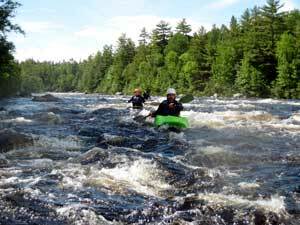 For those of you who decide to travel to the gorgeous state of Maine to paddle, the Kennebec River is a must for both advanced boaters and beginners to the sport. 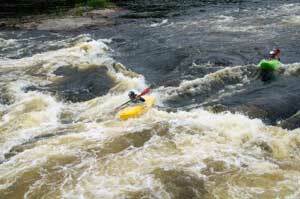 Not only does the Kennebec River offer some incredible waves, the scenery is spellbinding. After the day of enjoying the rapids, you can also hike into “Moxie Falls,” an easy class II two-mile hike into the woods to see Maine’s tallest waterfall. Toped off with a slice and six-pack from town, it’s the perfect ending to a perfect day.